A telegram from Sergeant John B. Hancock (1913-1944) to his wife, Edna P. Hancock. In the telegram, Sgt. 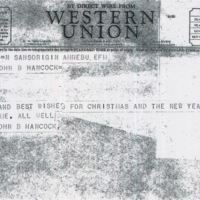 Hancock sends his love and best wishes to his wife for Christmas and the new year. P) store in Haines City until he enlisted in the 45th Infantry Division's 179th Infantry Regiment. Sgt. Hancock served initially in Africa in 1943, until the 45th Infantry Division's participation in the Allied invasion of Sicily, codenamed Operation Husky. The division then went on to participate in the Allied invasion of Italy, where Sgt. Hancock was injured. He was returned to duty in February of 1944 in southern France. On November 1, 1944, Sgt. Hancock went Missing in Action (MIA) after serving in the Allied invasion of Southern France, codenamed Operation Dragoon. He was eventually buried at Epinal American Cemetery and Memorial in Dinozé, France. Photocopy of original 1-page typewritten telegram from John B. Hancock to Edna P. Hancock: Private Collection of Linda Hughes. 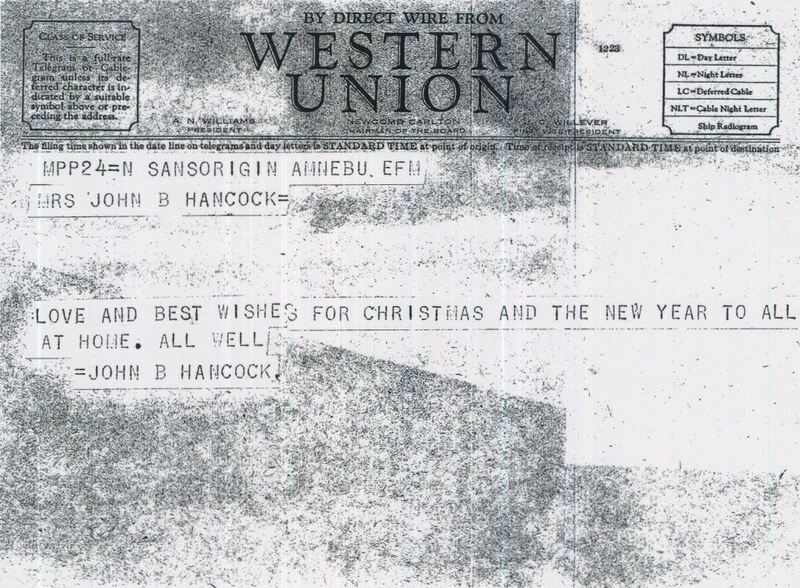 Digital reproduction of photocopied 1-page typewritten telegram from John B. Hancock to Edna P. Hancock. Epinal American Cemetery Collection, RICHES of Central Florida. Originally created by John B. Hancock. Copyright to this resource is held by Linda Hughes and is provided here by RICHES of Central Florida for educational purposes only. "Killed in Action." RICHES of Central Florida. "Telegram from John R. Hull to Edna P. Hancock (April 23, 1945)." RICHES of Central Florida. Hancock, John B.. “Telegram from John B. Hancock to Edna P. Hancock.” RICHES of Central Florida accessed April 21, 2019, https://richesmi.cah.ucf.edu/omeka/items/show/9372.